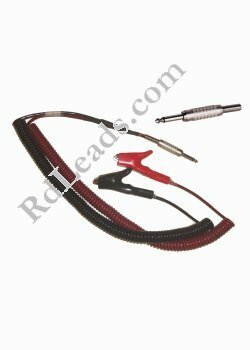 Lead Sets for Radio Detection RD 4000 - RD 7000 - RD 8000 either Straight or "Coily Cord"
This site is designed to calculate shipping for orders to the US, Australia, Canada, New Zealand, United Kingdom & Ireland ONLY. Shipping charges are reviewed as they are packed so if we find a slightly less expensive charge we will refund the difference. I do have certain products on eBay.com with Global Shipping so that is also an alternative. Just search for "RDLEADS". All lead Sets are Hand Made in the USA NOT Machine made and are individually tested. For my staright lead sets I use a larger gauge & higher quality, High flex, tinned copper lead wire resulting in stronger leads. Period. 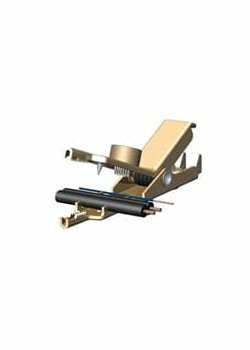 We manufacture different Direct Connect leads sets for Radio Detection, certain Ditch Witch, Certain Dynatel, certain Metrotech, certain Pipehorn, certain Subsite & certain Vivax equipment. Many of my lead sets will fit other transmitters that are not listed depending on the end connector as many have common wiring configurations. 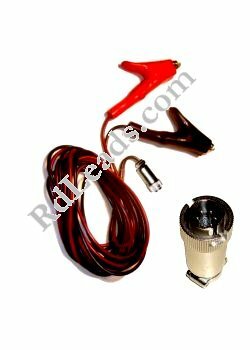 ALL of my leads sets use the insulated Crocodile Clips on the ends as used on the Radio Detection RD 8000. Only the transmitter connector plug is different unless otherwise noted. These have been found to have the best opening capacity, (approximately 1" or 25 mm), and longevity of all of the end connector clips I have used. Warranty : I test every set before it leaves here so I warranty that they work when I ship them to you but I will repair or replace them if they fail for any electrical or mechanical problem in the first 30 days. 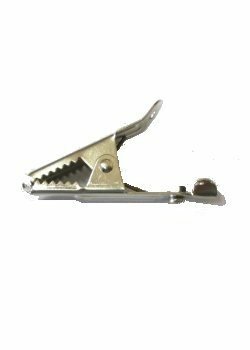 I will not warranty broken off crocodile clips or wires pulled out of the connector from abuse, cut wires, normal wear & tear, etc. Returns to me to review the problem are at your expense. They will be repaired or replaced at my discretion. Our standard direct connect straight lead sets are 10 Ft but we can make up sets in any length you want. Please note that custom made sets are non-returnable and non-refundable. Just use the "Contact" button and email us for a quote. This is a small spool with 20 Ft of 20 awg 26/36 stranded, High Flex Tinned Copper Wire with (1) Heavy Duty Banana Plug & (1) insulated Crocodile Clip. 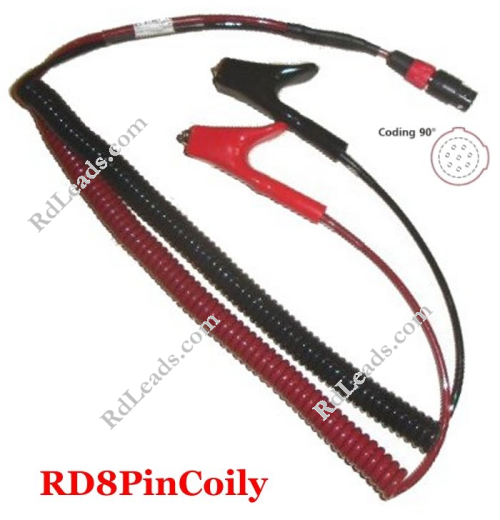 These "Coily Cord" type leads fit the RD4000, RD7000, RD8000 & RD8100. When new they are approximately 18" retracted and each lead expands to just over 7 ft for a total spread of 14-16 ft. 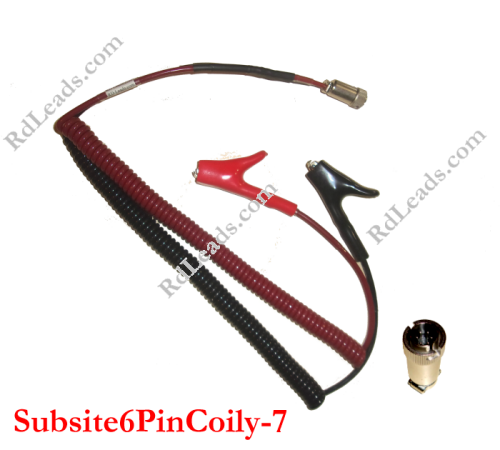 These "Coily Cord" type leads fit the Subsite 910/950 Series. When new they are approximately 14" retracted and each lead expands to just over 5 ft for a total spread of 10-12 Ft. These "Coily Cord" type leads fit the Ditch Witch / Subsite 830T. When new they are approximately 14" retracted and each lead expands to just over 7 ft for a total spread of 14-16 Ft. 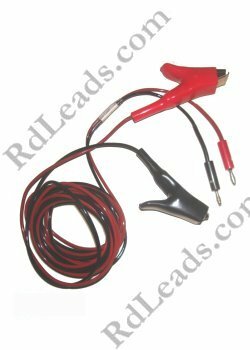 This is perfect for the situations where your leads aren't quite long enough to complete your circuit. The spools have removable, snap around sleeves so when you wind it back up & snap on the sleeve, the wire will stay on the spool in your equipment bag. Please note that the insulators on the Banana Plug and the Crocodile clip may be either red or black. Priced at $15.50 USD plus shipping. 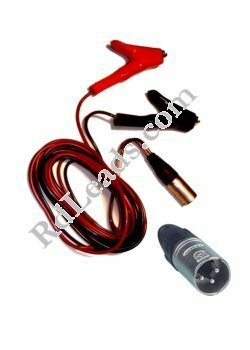 These lead sets fit the Radio Detection RD4000, RD7000, RD7100, RD8000 & the RD8100 and use the 8 pin plug. 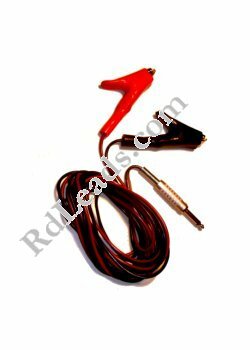 The Heavy Duty * RD lead set I sell is is 10 ft per lead or a useable distance of about 19 ft when spread apart, (6" is kept together near the connector end for an additional strain relief) and are ready to plug in and use. 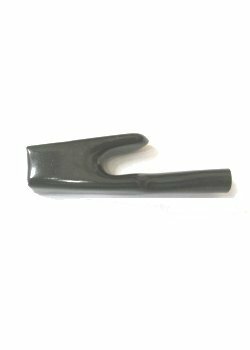 I use the OEM RD equipment plug & the OEM insulated Crocodile clips, the lead wire is High Quality, Heavy Duty, 16 awg kinkless, vinyl coated, stranded 65/34 tinned copper wire, resistant to chemical corrosion and fungus. Tinned, copper lead wire is important as when the insulation gets cut the leads wires get moisture and untinned copper stranded wire can get brittle and break. Priced at $45.00 USD plus shipping. 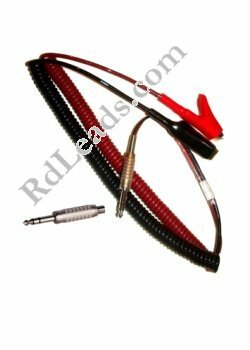 * Please Note: the factory leads supplied from Radio Dectection and others are 18 awg or 20 awg with thick insulation but the wire is a smaller diameter than the Heavy Duty 16 awg leads I manufacture for my straight lead sets. 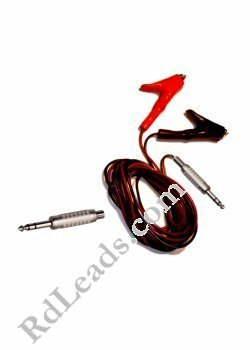 These leads fit the old RD400STX/RD433HCTx2 units that use the 3-Pin Connector lead sets, also in a 10 ft per lead or a useable distance of 19 ft when spread apart, (6" to 1 ft is kept together near the connector end for strain relief). These leads fit many of the Metrotech & Vivax units that use the 3 pin connector. Priced at $40.00 USD plus shipping. 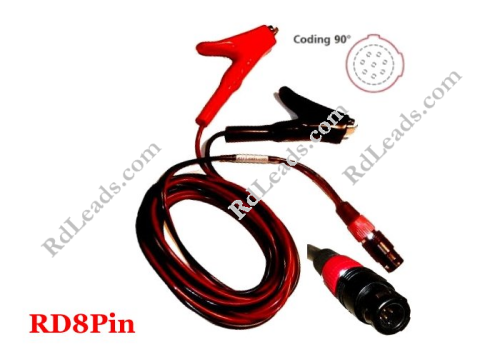 I use the OEM RD equipment connector & Deltron insulated Crocodile clips, the lead wire is High Quality 18 awg, kinkless 41/36 stranded copper wire with rubber insulation. 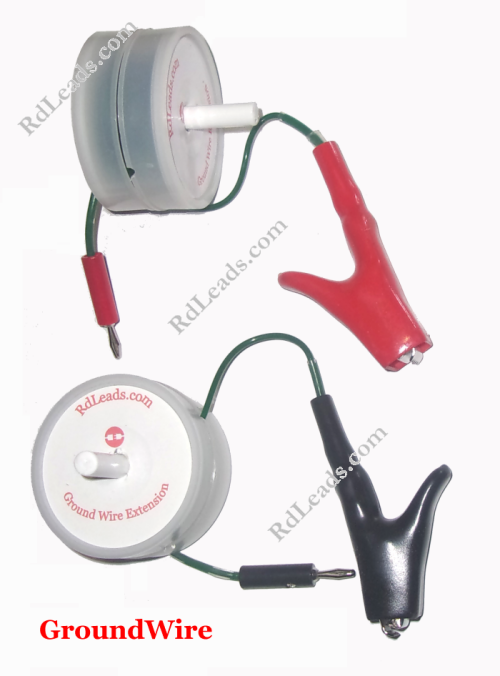 The leads are about 18" when retracted and about 7 ft + when extended giving an overall spread of about 14-16 ft. I have changed to a thicker insulated cable which does not fit into the RD connector so there is a splice at the connector end to a wire gauge that fits into the connector. Like all "coily cord" type leads, they should not be overextended too much from their rated length. Priced at $75.00 USD plus shipping. 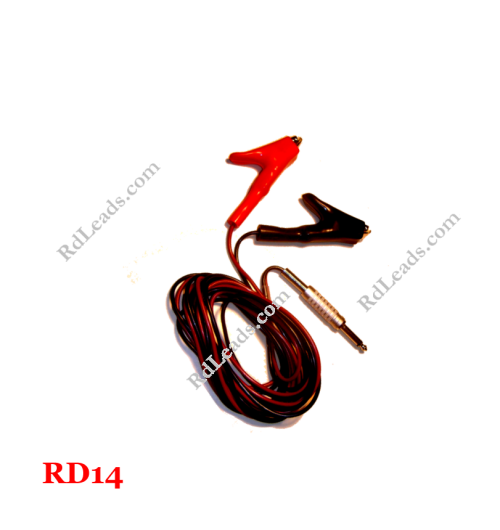 These leads fit the RD400LCTx and use the 1/4 in standard Mono Phone plug Connector lead sets, also in a 10 ft per lead or a useable distance of 19 ft when spread apart, (6" to 1 ft is kept together near the connector end for strain relief). 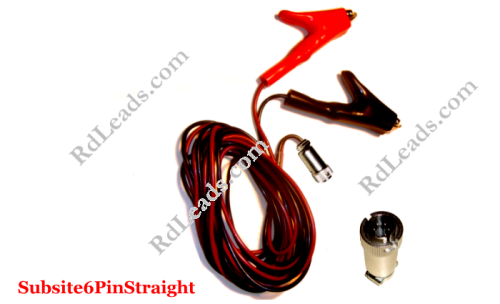 These leads also fit other brand transmitters that use the 1/4" Mono Phone Plug connector like the Metrotech 810, Pipehorn 800 Series, Vivax & the Dynatel 2273. Priced at $36.00 USD plus shipping. 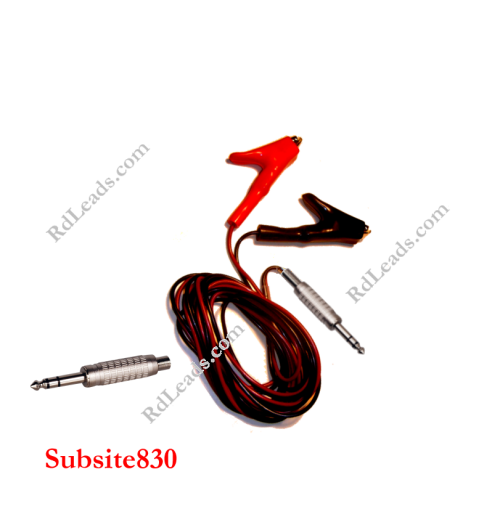 These are the 6 pin Subsite straight leads for the 910/950 series, 10 ft per lead or a useable distance of 19 ft when spread apart, (6" to 8" is kept together near the connector end for an additional strain relief). 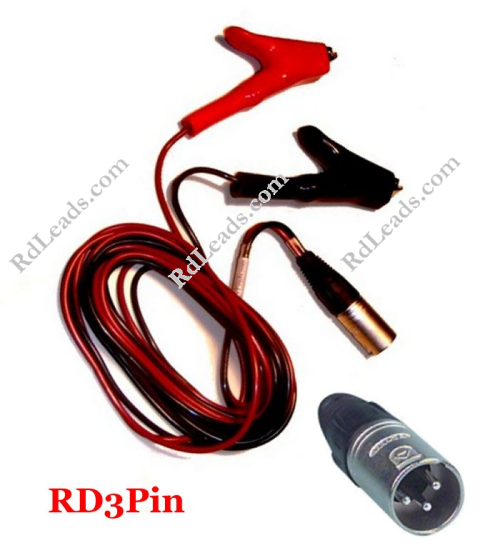 I use the Radio Detection (RD) style OEM insulated Crocodile clips on the ends. These are made to order - allow a few days after order is placed. Priced at $55.00 USD plus shipping. I have changed to a thicker insulated cable which does not fit into the Subsite connector so there is a splice at the connector end to a wire gauge that fits into the connector. 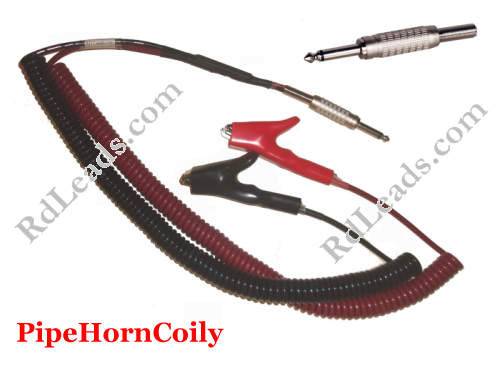 Like all "coily cord" type leads, they should not be overextended too much from their rated length. Priced at $80.00 USD plus shipping. Priced at $71.00 USD plus shipping. 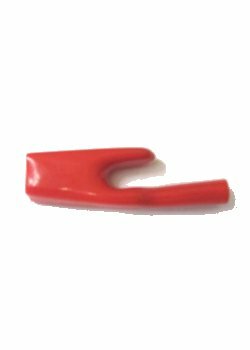 These are straight leads for the Ditch Witch / Subsite 830T, 10 ft per lead or a useable distance of 19 ft when spread apart, (6" to 8" is kept together near the connector end for an additional strain relief). 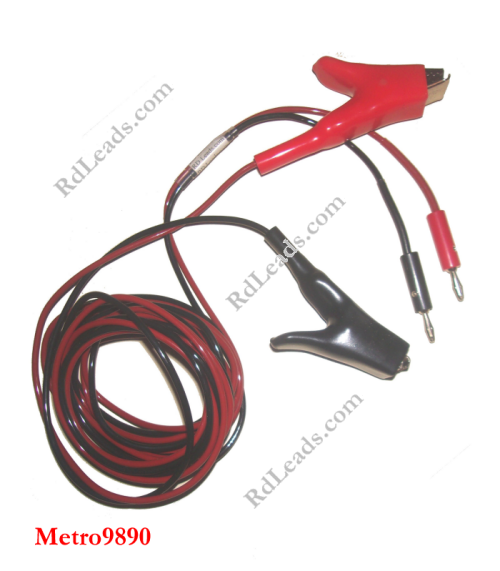 These are straight leads for the Metrotech 9890, 10 ft per lead or a useable distance of 19 ft when spread apart, (6" to 8" is kept together near the connector end for an additional strain relief). These are Insulated Banana Plugs to Radio Detection (RD) style OEM insulated Crocodile clips on the ends. Priced at $37.50 USD plus shipping. 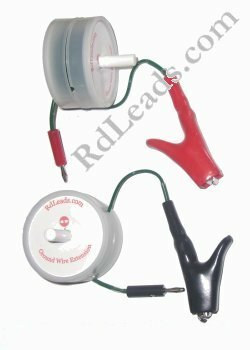 These leads also fit all transmitters that use the 1/4" mono phone plug like the Radio Detection RD400LCTx, certain Vivax/Metrotech, the Pipehorn 800 series & the Dynatel 2273. Priced at $60.00 USD plus shipping. As a former locate technician, I have had to deal with the inevitable lead or clamp failure. Unfortunately it's a matter of "when" not "if" they will fail in our line of work. I wasn't happy with the construction and durability of the factory leads so I designed my own set using a higher quality and larger gauge wire and different assemby tecniques. 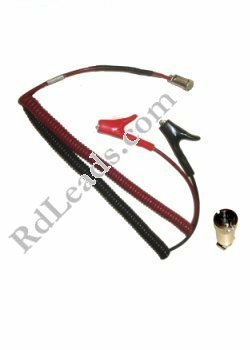 After making some for associates, I started Rdleads.com in 2013 and have expanded from just leads for the Radio Detection RD 8000 to leads for older Radio Detection products, Ditch Witch 830T, certain Metrotech products, certain Vivax products and for the Subsite 910/950. 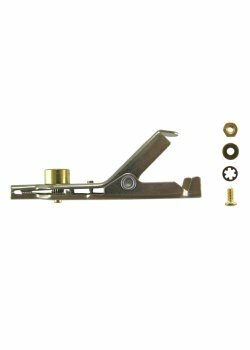 Please email via the "Contact" Button with the parts and quantities you wish and I will manually quote or invoice you as you would get over charged shipping if I used a "Add to Cart" button for these small parts. 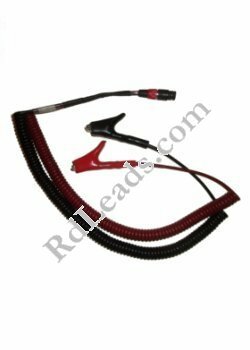 When your leads arrive for repair I inspect them to determine what parts are missing or defective then arrive at a cost and will contact you with a cost estimate of all parts and labor and a time estimate prior to doing any repairs. This estimate is free. Please keep in mind that the wires will be cut back at each each end as these are the failure points and your repaired leads will be slightly shorter. Please note that it is usually NOT cost effective to send a single set for repair as you will also have the cost of the return shipping. Wait until you have multiple sets before you have them repaired. Do NOT under any circumstances send any equipment to me for repair without me approving in advance as I accept no responsibility for items I have not authorized to be sent to me. When your clamp arrives for repair I inspect it to determine what parts are missing or defective then arrive at a cost and will contact you with a cost estimate of all parts and labor and a time estimate prior to doing any repairs. Please keep in mind that the cable will be cut back at each each end as these are the failure points and your repaired clamp cable length will be slightly shorter. If it is determined that the wires inside the cable are badly oxidized and have to be cut back too much, a cost for replacement cable is currently about $30.00. If the ends of the clamp to stay closed but do not make contact evenly, a PVC clamp "guide" can be fabricateed and attached to one side at a cost of about $15.00. Labor runs $45.00/hr plus the parts costs and the return shipping. It takes about 3/4 hr to 1-1/2 hrs for a clamp repair depending on its condition. I will need the form completely filled out to prepare a PayPal invoice if you decide to order. © 2018 RdLeads.com. All Rights Reserved. 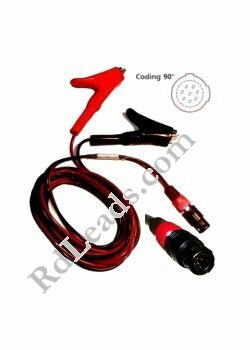 RdLeads.com is not affiliated with Ditch Witch, Metrotech, Radio Detection, SPX, SubSite or Vivax which are registered trademarks of each respective Company.